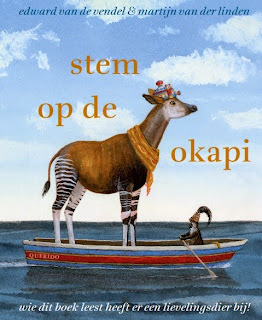 Last year our non-fiction book STEM OP DE OKAPI (VOTE FOR THE OKAPI) came out in Holland and now it travels to Estonia. The book was richely illustrated by the great Martijn van der Linden and contains a warm plea for this shy but majestic animal. There are many, many drawings, there are interviews, poems, historical parts, lyrical descriptions, there is an Okapi Museum - and Martijn and I received the Woutertje Pieterse Award (best book of the year, experts' choice) for it, as well as a Zilveren Griffel (for the text) and an Honorary Mention (for the illustrations). Publishing house Päike ja Pilv will issue the book in Estonia. Before they did my two books about the dog Sam. As those two, VOTE FOR THE OKAPI will be translated by Kerti Tergem. Rights for the book can be negotiated here, and translation grants can be requested here.